The Series 350 DC Gauging LVDTs are rugged, spring-loaded versions of our Series 240 DC LVDT's. 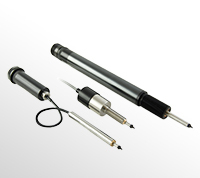 These transducers are excellent replacements for dial indicators, or any other manual gauging instrument. Powered by a DC excitation voltage, these units will output a high level DC voltage signal suitable for input into a PLC, A/D Board, or Digital Volt Meter. In Alberta Terracene Int'l Ltd.